Do you ever have days where you know exactly what you need to target, but are just looking for a different way to do it? I know I have had many days like that, especially when working on articulation. My first year in the schools, I know that I was so frustrated with the monotony (to me at the time) of working on articulation, that I wasn't sure I even wanted to do the job anymore! With my crazy caseload now, I have gotten over the feeling that articulation work is monotonous, and now embrace the time I have with my students working on articulation. We can have so much fun together! 1. 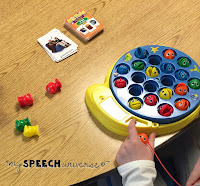 Go Fishin- This is a game that I had in my speech room, and every time I had it out for my preschool population, my older students would see it and want to play too. So, I changed it into a way to use it for articulation work. I wrote numbers on the bottom of each fish, so that each time my students catch a fish, they have to say their word or sentence that many number of times. If I could do this again, I would start with higher numbers (I did 1-4) to get more productions. 2. Making Progressive Sentences- My kids think this is hysterical. 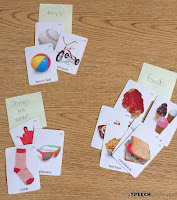 We start with one articulation card and make a sentence. "I see a soccer player." Then, we add a card and add to our sentence. "I see a soccer player eating a sandwich." Then, we add even more! "I see a soccer player eating a sandwich with Santa." 3. Chipper Chat- This is my one go to item that is fun for all ages. My students LOVE to pick up the chips with the magnetic wand. Students roll the dice and say their word or sentence the number of times on the dice. Then, they get chips to put on their board. When they fill up the board, they can take the chips off. Sometimes, I have students start with all of the chips on the board and take that number of chips off the board. 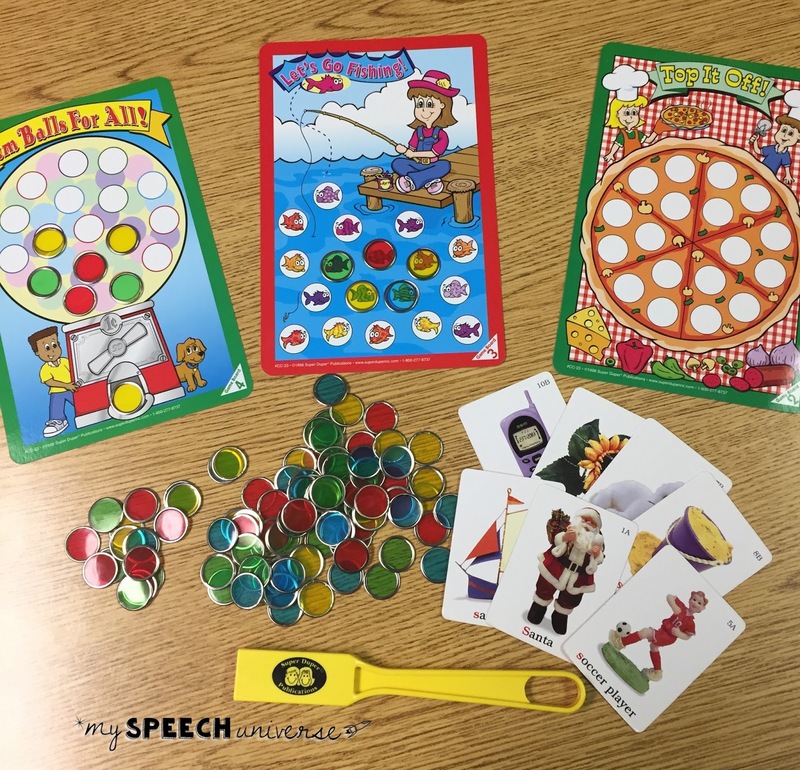 I use the set from Super Duper Inc., but there are lots of different magnet chip boards that you can find on Teachers Pay Teachers. 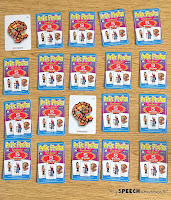 If you don't buy the Chipper Chat set, you can find a bingo magnet and chips at a store like Wal-Mart or Target. I have even seen them at the dollar store occasionally. 4. Paper Clips on Articulation Cards- This works great with the chipper chat magnet wands. 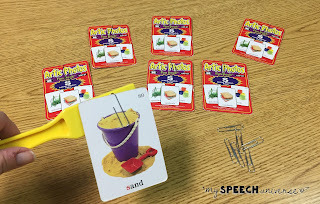 Just put paper clips on your articulation cards, and the kids can go fishing for cards. I like to put the cards face down so that the cards are a "surprise" each time. 5. Memory- Ok, I'm sorry, but really, my kids of all ages still LOVE to play memory! I try not to play it too often so it doesn't wear out it's welcome though. 6. 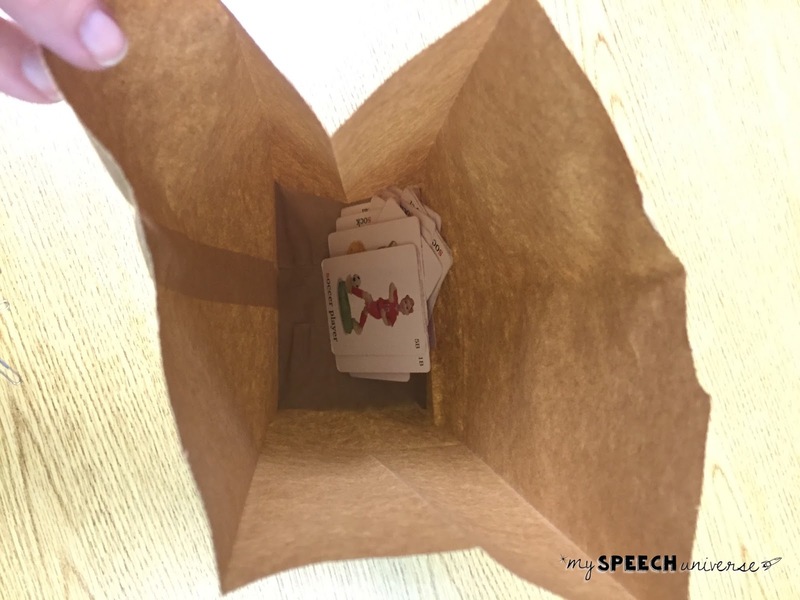 Paper Bag- Put cards in a paper bag and pull them out. Try to guess what you will get before you pull it out. If you guess correctly, you get to keep it. 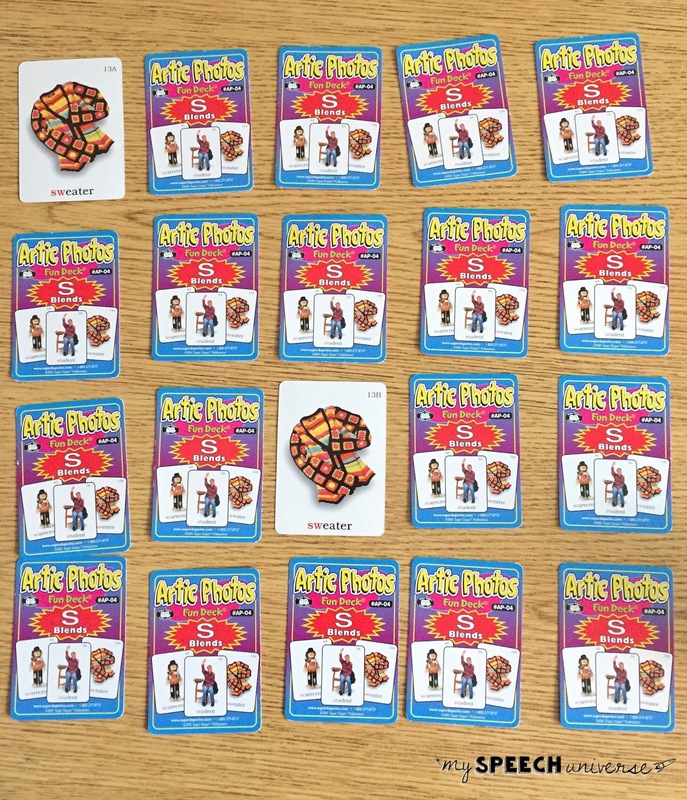 First person to guess all of their cards correctly wins. Some kids have a really eerie ability to do this! 7. A Good Book- I love to take a good book out for students and try to find words that start with their sound. I pull out a piece of paper and we write down all of the words that have their sound. I love when I can have them bring books from class for this so that they may think about those words again during reading groups with their teacher. 8. Categories! I have students pick a word from their articulation cards and tell me the category of the item. We create piles of different categories and see how many different piles we can make. Students have to say their word in a sentence, "A sandwich is an food." 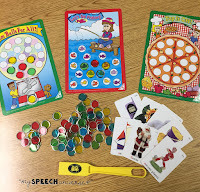 I love this activity because students get both articulation and language benefits. 9. Guess the Item- I describe the articulation word to the student and see if they can guess the word I am describing. 10. Articulation Recall- We roll the dice to see how many cards the student has to recall. I then present that number of words to the student and give them a moment to memorize them. Then, we flip them over face down and see if the student can recall each word before flipping it back. There you have it! 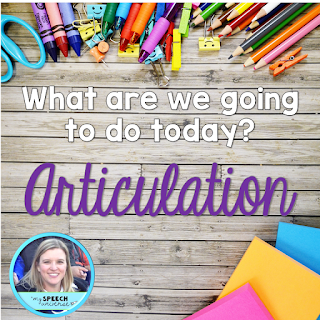 Whether you are just starting out or a seasoned veteran, hopefully some of these ideas will help you to cut the monotony and put more fun in your articulation sessions. I'm going to try the paperclip on the card idea! Don't forget that any board game can be used in therapy, too. Just have the student say their target x amount of times, then take a turn. Also, use repetitive sentences as an integrated part of the game. An example is having a box of legos. The R kids can say "I'm Ready to put this bRick Right heRe", The S kids can say "I'll Stick theSe SpotS juSt like thiS". You have to be creative and sometimes awkward with your sentences, but you can get a lot of sounds really fast. (And have them use a tally counter to keep track of their own sounds - that takes some training, because they can't click after the fact, it has to be during the production). 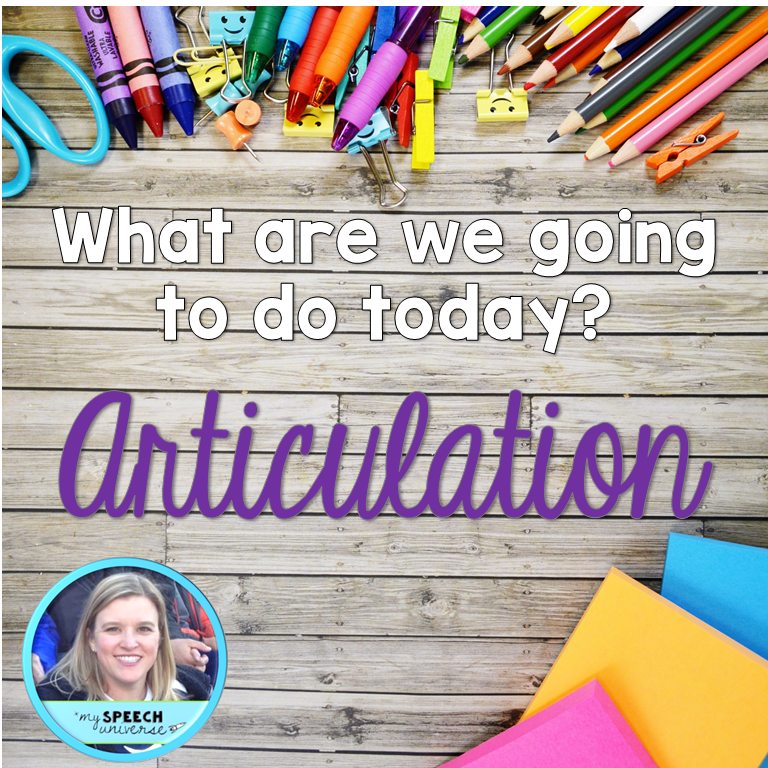 Thanks for sharing 10 Articulation Activities for our speech room.I really found it do helpful.Keep sharing such useful stuff in future too. good ideas for classic materials! Thanks!